Are you looking for healthy vegan recipes?! Or do you want something tasty, delicious, and want to stay healthy? Inside this book, you will find over 20 reasons to stay healthy and go vegan! Are you trying to find the healthiest vegan snacks because you do not have enough time to cook? Take a look at this healthy vegan soups cookbook! We already created these recipes! No worries about your time, these vegan soups are easy to prepare! You need only 20 minutes to cook and enjoy! 1. Tasty soups for a gluten-free diet. 2. Healthy and easy to prepare vegetable recipes. 3. These soup recipes are perfect for your weight loss plan. 4. Detailed, step-by-step instructions with photos. Tested and proven vegan soups for your healthy way of life! 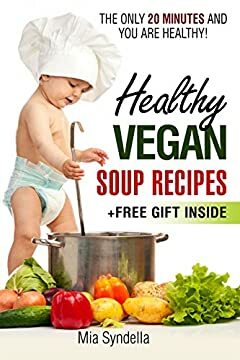 Make your life healthier with this vegan and gluten free soups cookbook!! !